RichEdit is a lightweight, handy and useful text editor which allows you to create, open, and save files using both the Rich Text Format and the Plain Text Format. 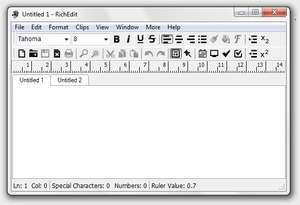 RichEdit has all the features of an advanced text editor. The fact is, RichEdit was inspired by many text editors including ConTEXT, Notepad++, Kate and GoldenPad. the graphical user interface (GUI) of the program is familiar and easy to work with. Version 3.3.0.0 is a freeware program which does not have restrictions and it's free so it doesn't cost anything. For security reasons, you should also check out the RichEdit download at LO4D.com which includes virus and malware tests. Additional screenshots of this application download may be available, too.